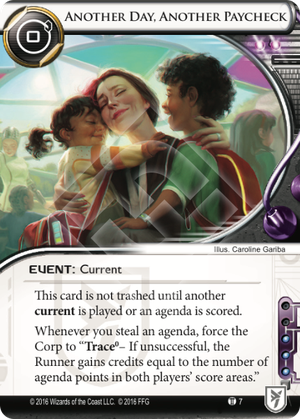 This is the first mini-faction card to see print since Data and Destiny was released, and it slots nicely into Sunny's playstyle. Sunny is, by design, a very slow, methodical runner, who starts weak but evolves into an absolute juggernaut as the game progresses. Her cloud breakers (Striker,Sherman,Shrike) are inefficient against small ice, but become massively efficient at breaking towering glacial ice, especially once you get some Security Chips. Her console Security Nexus requires that you get yourself some extra link strength to really be effective, but lets you effectively ignore a piece of ice every run. And because she uses cloud breakers and has two link, she has a fantastic drip econ package with Data Folding and Underworld Contact. "Another Day, Another Paycheck" is an economic card that lets her close out a game in style. It's no use in the first couple turns of the game, or if you've been completely locked out of their scoring server. But suppose the corp is sitting at 4 points, and you steal an agenda to bring you up to 5 points: that means that if the corp can't win that trace, you walk away with a whopping 9. So the corp might try to win the trace. This is also a win for Sunny. Even if Sunny has played no other link-boosting cards, the corp has to spend at least 3 to have any chance to block Sunny from gaining the credits. But in that case, Sunny can just call by spending 1 and immediately turn a profit--smaller than she would have had otherwise, but with a 3 tax on the corp to balance it out. And of course, if you're playing a Security Nexus build you will have a lot more than 2. Unfortunately, while this card provides Sunny with another late-game economic option, that was never her issue. Late-game Sunny already has 4 or 5 pieces of drip econ going; having a money-making current (which can be sniped out by a quick 15 Minutes or Breaking News) doesn't substantially change her board state. And you would never see this out of faction. Three influence is a lot to ask already, and without some link strength the corp tax isn't strong enough to be worth including. In short, it's a well-balanced Sunny card that makes her better at what she does best, but doesn't shore up her greatest weaknesses, and is supremely underwhelming out of faction. But look at those cute kids. This art just puts a smile on my face. You go, Sunny.